The UK's decision to stop subsidising new onshore wind farms will make it harder to meet renewable energy targets, the EU's climate chief says. Miguel Arias Canete said the EU had already calculated that the UK was not on track to meet legally binding goals. Asked by BBC News if the wind decision would make the task harder he replied: "Of course". His officials have expressed bemusement at the decision to end subsidies for onshore wind energy a year early. They said onshore wind was by far the cheapest way to hit the target of 15% of all energy from renewables from 2020. The SNP estimate the change will cost bill payers up to three billion pounds. After a media briefing on climate policy at the European Commission, one official told the BBC the decision was "mind-boggling in an economy that's supposedly price sensitive." 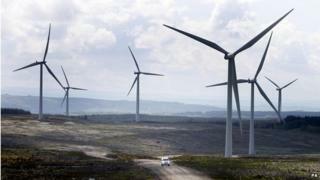 The official said the EU would not interfere in the UK's energy choices, but expressed doubt whether it would achieve renewables targets without more onshore wind, and whether future energy subsidy auctions in the UK would breach EU state aid rules if nuclear was included and onshore wind barred. The Department of Energy and Climate Change said the UK was making good progress towards the EU 2020 target on renewables. A spokesman said the UK had come a long way already; in 2005 1.4% of energy was from renewable sources, for 2013 the renewable share was 5.1% of energy. On the question of breaching state aid rules on future subsidy auctions a DECC. spokesman told the BBC: "We have the tools available to implement the government's manifesto commitments on onshore wind and will set out how we will do so when announcing plans in relation to further CfD (subsidy) allocations." The government promised before the election to end new subsidies for onshore wind following pressure from UKIP to halt the spread of wind farms across rural Britain. Last week, Energy Secretary Amber Rudd announced that she would cut short the subsidy period for the relatively mature technology of onshore wind and shift cash into forms of energy that needed support more. There is no news yet as to which technologies will benefit, or how the same amount of energy will be obtained without spending extra money on a much more expensive option like offshore wind. The government's decision was welcomed by UKIP, the Taxpayers' Alliance and community pressure groups which said wind farms were ruining the countryside. It was condemned by most energy academics, environmentalists and by the CBI which said it would undermine investor confidence in the UK.